In 2001, my sister and I each had a child graduating from high school and we decided to make a quilt for each of them as a gift. I was going through a bit of a slump in my sewing so I let my sister pick the pattern. She had this great pattern for denim quilts and thought that would be a good choice for her son and my daughter to take to college and since I had no better idea it was decided. We got together at her house and got the two tops made in a day or two and though both of the graduates were in and out of the house, neither had a clue. I loved the concept of this pattern and was inspired to make a few more, and then a few more and now I have no idea how many I have made based on the pattern but it is well over 100. 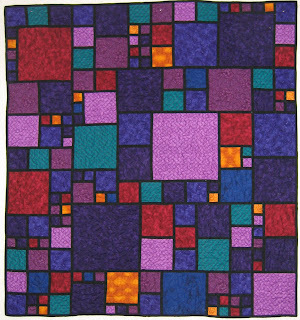 The pattern was adapted from the pattern for the cover quilt on Kaffe Fassett's book Glorious Patchwork. I am not sure who adapted the pattern for denim but it was inspired. I have changed the pattern a little to make it easier for this method, but it can be done as printed in the book. I make my quilts out of old jeans because I love the variations in the fabric as it fades and the pockets are great. You can also use new denim of various shades or colors. If you are using jeans, you either rip them at the seams or cut them apart. Then you cut squares that are 2", 4", 6", 8", 10" and 12". You also need the fabric for the strips in between the blocks. The pattern called for black cotton and I have used several bolts of 60" black Kona for these quilts! The black is cut into 1" strips. Some of the strips are cut into 2", 4", 6", 8", 10" and 12" lengths as needed. Some are used for the strips between the rows. The basic method here is to put a strip of black between each block of denim. The beauty of this is that you are never sewing denim to denim so the seams don't get too bulky. You need to practice with your machine to get the right seam allowance. I have found that if I use my 1/4" foot for this quilt the pieces don't match up as they should so I use the regular foot on my Pfaffs and sew more of a true 1/4" seam as opposed to a scant 1/4". My first thought after I got the pattern was to use the sleeves that I cut off the twill coverall's that my husband wears for work. I have always saved them (I know, a little crazy) and he has had grey, forest green, cadet blue and navy blue coveralls over the years but that looked pretty boring so I went to thrift stores and fabric stores and found some twill prints that tied them all together. This is the one I made for my husband using up the last of my twill pieces (at that time) and as you can see I only had 2", 4" and 6" pieces left. In the first few years I went to thrift stores and picked up jeans for the quilts. I found that 12" squares aren't easy to get from most jeans so I bought some denim dresses or jumpers and occasionally very large jeans. I've also found a few pieces of denim yardage at the thrift stores or bought some on sale for the larger pieces. I have gotten some great colored/print denims at the thrift store in the children's section and a few in the women's section. I found one that was a white denim with huge blue roses that should never have been made into a pair of size 20 capris! It did work well in my king size quilt when added to yellow, green and blue denim! Now, since people know I make quilts out of old jeans, they frequently ask me if I am still making the denim quilts and hand me grocery bags of jeans. This is why I have several boxes of jeans in my attic waiting to be cut up! The best thing about this pattern that makes a 52" X 56" quilt is that it can be easily adapted to make a larger quilt or to use different pieces if you don't have the correct number of pieces of the various sizes from the jeans you want to use. It is all based on a 2" grid. The pattern starts in the middle with a 12" square and then rows are added similar to a log cabin block. Here is one I made for a friend using jewel tone quilting fabric. Love this one!!! This is one I made this summer experimenting with a pink print fabric for the strips instead of black. After getting this round robin quilt put together I decided to use some cream/tan denims with a maroon Kona for the strips and got this great quilt. As I said earlier, I have made more than 100 quilts based on this pattern. I made 7 or 8 using Christmas prints, a couple for wedding quilts using the wedding colors in various prints and one using Laurel Burch's Ocean Song swirl fabrics in various colors. Most have been denim and many of those were donated to the foster care program in our area for foster kids graduating from high school. I have found that teenagers love these quilts. They are also great for baby quilts or young children as they are very sturdy. The original graduation quilts and my king-sized quilt were professional machine quilted by a friend. Then for the next few years I tied the quilts until I got brave enough to machine quilt them on my trusty Pfaff 1222's. If you have any questions, or would like me to email the pattern to you, just email me. *****UPDATE***** - I am no longer sending out the pattern via email. Due to the high demand it is only available from my Etsy shop: LucysQuilts. Also, comments are moderated so it may take up to a couple of days for it to be posted if I am out of town but I will get to it and respond so you don't have to comment again if you don't see your comment right away. What great quilts! The best use of worn jeans that I've seen in a long time. Happy New Year! I really like your Denim Quilts. I am inspired : ) do u do tutorial with them? Jessisca from geneleenloire at yahoo.com. These quilts are so beautiful I just wanted to say thank you for sharing this wonderful idea. Just finished cutting my squares yesterday; can't wait to get it sewn today. I plan to make at least 4 for my kids for Christmas. I have looked long and hard to find a pattern I like and this just fits the bill! Hi Alicia, I have just found your blog, and I am hooked! Love your quilts! Would love to get my hands on the Denim/Stained Glass pattern. Granddaughter saw it and now has to have it. She's an up-and-coming quilter! Thanks sew much for sharing your talents! Toni, send me an email and I will send you the pattern. Alicia, would love to send you my address, but the link to your "email" on your profile is not active. Just tested it and it worked for me, but if it doesn't for you it is lucysquilts at gmail dot com. Your denim quilt looks lovely. Can you share the pattern especially the tips about the backing and finishing. I love this idea! Thank you for sharing! I would love the pattern if you don't mind emailing it to me. Beautiful quilts! I would love to have the pattern. Debby, I would love to send you the pattern but I need an email address or I need to be able to access your profile. Sheila, I would love to send you the pattern but I need an email address! Wow I absolutely love you stained-glass look quilts! I found your site through Pinterest... I was looking for ideas and I had gone through the kids clothes looking for material and found lots of denim they have outgrown but I had not found a pattern that spoke to me. This pattern fits exactly! Would you mind sending the pattern? I would be extremely grateful. My email is kaside3@yahoo.com. Thank you so much and prayers for your health to keep improving. Lucy, Your quilts renewed my love for Denim. I am cutting blocks, but would love to get close to the right number of each different size. Please send any patterns and instructions and numbers on blocks needed. I found your site from Katie's Quilting Corner. I was really tired of the rag blue jean quilts. This one is very nice. I would love to have the pattern please. KCROSE16@gmail.com. I have SOOOO many pairs of jeans from everyone. Thanks for your help. Now I'm excited again. Love this idea. I'm really not excited to do the rag quilt out of jeans. I would love this pattern to get me more motiviated. I have a huge selection of old jeans and really think this quilt is awesome. Thanks for your inspiration. I would love to have the pattern also, I just turned down an offer to make a denim quilt because I didn't want to put stress on my machines, but this will really do the trick! paulabray2001@gmail.com thank you so much! Love the quilts you've created. Could you send the pattern to: akavicki@bellsouth.net. Thanks, just moved to cooler weather and would love to try this. It would be wonderful to see the backs of some of these as well. Would love to have this pattern. It's beautiful and looks fun to make! DeLawno@aol.com. I absolutely LOVE this quilt pattern! I have several pairs of jeans and will begin to make some quilts for my many neices and nephews. If you would please e-mail me your pattern to: jokims@cs.com. I will share photos with you upon completion. This is so exciting!!! Your quilts are just beautiful and would really love the opportunity to give this a try. Thank you for offering to send your pattern. I can't wait!!! As everyone says, I too would like your stained glass pattern for denim. thanks in advance. Awesome quilts! You mentioned machine quilting on your Pfaff 1222. Mine was handed down to me years ago, and I'm just beginning to realize what a wonderful machine it is. Do you have any posts detailing how you go about quilting larger projects on it? I'm thinking of creating a king-sized corduroy quilt with this method, and have no idea how to manage the actual quilting of it. If you could send the pattern to m_alcorn@juno.com I would love to make this for my camper. would love a pattern please! Thank you for your blog! Could I get the pattern for your Denim Quilt please? Alicia, I love your denim quilts. How wonderful that you have made so many for charity. Is it too late to ask for a copy of this pattern? Please e-mail it to my profile e-mail, and thank you in advance. These are great. I would love to have the pattern. I love your denim quilts. They are beautiful! I would love to be able to make one for my granddaughter. Could you please also email me the pattern and tips? Thank you everyone for your lovely comments. I didn't check the comment moderation section forever and I apologize. I am sending out the pattern to everyone who gave me an email address. If you didn't give me your email address, leave another comment with it and I will get the pattern to you! Elaine, you asked about quilting using the Pfaff 1222. I am not sure if I have posted about quilting using that machine on the blog but if you send me an email I will talk about it with you that way. It is a great machine! I have followed a couple of links to get here and must say how much I love your quilts! I do a lot of working with recycled denim and have an over-abundant stash at the moment and wonder if you are still willing to share your pattern? I would love to make one after Christmas. I have made a few of the 'rag' versions, but yours is so much prettier. If you'd like to see what I do with denim you can check out my blog and look for the heading 'recycled denim'. This is beautiful and I also have a big stash of jeans in the attic to cut up! Can you email me the pattern? rls757@gmail.com Thanks! Just found this post through Pinterest, and I would love to have a copy of the pattern too please! Thanks so much (all the pics are so lovely btw). I would love to have the pattern for the denim quilt. Please send to dqlts at hotmail.com. Thank you very much! love this patterns and your beautiful quilts! This is just what I am looking for as I have a growing stack of denim/old jeans that I have kept so I could one day make a quilt. Well--that day is now! Could you please send me the pattern? love this pattern! You have such beautiful quilts! could you please send me copy of the pattern? Beautiful denim quilt! I have been making denim quilts for about 5 years now, and this is a unique pattern - and LOVE the stained glass look! Please send me the pattern to: noreen.rude@shaw.ca. I would also like to request your pattern! (glenesln@gmail.com) It is fun to see how long the interest in your quilts and your pattern have carried on. Congrats to you; you have a winner! Thank you very much. This is the prettiest denim quilt I have seen! I have bags of old jeans that are begging to be used. I had planned to make rag quilts, but now I'm inspired to try this much classier design. What do you use for batting/backing? I would love to have the pattern...please email to ldhdmh@msn.com. Thanks!! This is absolutely a gorgeous pattern that is very adaptable. I would love to have this pattern so I could make my two boys and grandson quilts of their own. I would love to have your pattern for this. It is a wonderful piece of artwork. Buchbergerfaye@charter.net. Plan to start working on it immediately! Hi Alicia...thanks for sharing this idea and pattern. I have tons of jeans in my storage room and lots with prints and colours so this project would be awesome to use them up. If you could email me the pattern, that would be truly awesome!! Hi... I know you have had a TON of requests for this beautiful quilt pattern and I too would like to throw out my request for a pattern. I have made one jean quilt, it was actually my first quilt ever and the front was just pieces of leftover fabric from other projects and the back was all jeans from my dad, my oldest son and my hubby. My kids love it...they love talking about all the cool fabrics on the front and who's pants are on the back..lol. My email address is angi7609@gmail.com...thank you so much. Could you email me the pattern and any tips for sewing denim? I've got lots of old jeans and found your quilt on Pinterest. Am anxious to create something new and useful with our old jeans. I would love the pattern for your denim quilt. I have containers of jeans that my sons have outgrown with the idea of making them quilts. This would be perfect. Thank you for sharing. Carol, I would love to send you the pattern but I need an email address. Comment with the address or go to my profile and click on the email link. Could you please send me your pattern for this? Thank you! Thanks for sharing the name of book and author. I have it ordered from Barnes Noble. Hi, What a great quilt....I have cleaned my sewing room WOWOO hOOO and am looking for a project to mess it up! Could you please e mail me the pattern? Thanks, Joyce e mail djjgbo@peoplepc.com, my birthday is tomarrow, what a great gift to myself to find this pattern! Love your stained glass jeans quilts quilts. I am working on my fourth jean quilt and would like to try something different for the next one. Are you still willing to share your pattern? Please e-mail to paparker6988 at gmail.com Thanks! I would love the pattern to your denim stained class quilt. do you use batting and a backing. I've made a couple denim quilts and they have gotten very heavy. Curious how you finished yours? Thanks for the pattern. I love your denim quilt stained glass pattern. could you email me it. Also how do you finish your quilts? I made a denim quilt before but it got very heavy. What do you use for backing and batting. Thanks! Hey Clorinda! If you want the pattern I will need your email address. I use either polyester or cotton battings and either a cotton or flannel for the backing. You could also use denim or corduroy for the backing and leave out the batting. I would also love your pattern for the stained glass quilt, it's beautiful! Your denim quilts are great, I just started in this wonderful quilting world, I would love to repeat this beautiful pattern you created. Could you please share it with me? I will really appreciate it. My email is free_life18@hotmail.com. Have a nice day! Hi - I love these quilts. Please send me the pattern. Thanks. I would love this pattern please! My email is kimberly@longrock.net. Lovely quilts! Could you please send me the pattern? Thank you so much! I LOVE this! I would LOVE the pattern to be able to make this up with my leftover denim I've had sitting around for years! Thank you SO much! I would also appreciate having the pattern for your beautiful quilts. Thank you for sharing! I love this idea. Could you please send me the pattern at pjy-nana@hotmail.com. I've been making denim quilts different ways for my grandchildren. This will be a really fun pattern to try. Gosh I really would appreciate it and thanks so much! I would love to have this pattern on hand for my next quilt! I'm almost done hand-sewing my first. I received a machine for Christmas this year and would LOVE to try your pattern. Your quilts are beautiful! My email is twin8mom@gmail.com. Thank you! Love your stained glass denim quilt, would love to receive the pattern please. my email is djklindworth@ hotmail.com. Love, love love!!! Can't wait to try this pattern. My e-mail is: ednanelson49@yahoo.com Thanks. I love this pattern!! I hope this isn't too ambitious for my first quilt but it will be perfect for my boys and their new beds. And since my oldest wears holes in the knees of his pants without wearing the rest of them out, I have a large stockpile of jeans waiting for me. I will need to alter the dimensions to make it for twin beds though (65x88). If you could include any tips to make this adjustment while maintaining the pattern I would really appreciate it. Thank you! aslauna@gmail.com. So this pattern must be the reason I have kept boxes of jeans!! I would really appreciate the pattern. Love the Denim/stain glass quilt. Would you send me a copy of it? My email address is Buckdrop4@juno.com. I love the denim/stain glass quilt. Would you send a me a copy of the pattern? My email address is merciesnew25@gmail.com. Like everyone else, I LOVE this pattern. Please send me the pattern and any additional information would be appreciated. My email is vtsoulismoodyblue@gmail.com Thanks! I have wanted to make this quilt for a long time. Could I please get a copy of the pattern? I love this! May I have the pattern please? My email is ames_234@roadrunner.com. Thanks! I would love the pattern as well. Thanks so much! Definitely would love to try this as my first "real" quilt. Your pattern is truly eye-catching, esp in the jewel tones! Here's my email for the tutorial when you have a chance: gpn6049 @ joimail.com Of course, no spaces. THanks! If you have commented asking for the pattern but haven't left your email address, please comment again with your address so I can get the pattern to you. I have so many jeans -- some already cut to those sizes and some yet to trim. It's a messy business to rip up jeans. Waiting for good weather to do it outside. I'd love a copy of the pattern. A denim quilt is on my "to do" list for this year. What size needle do you use? I'd love a copy of the pattern. I have a pile of jeans waiting for a new life. Please send pattern to blwine93@gmail.com. Thank you. I would LOVE to have a copy of this pattern! My Mom has been holding on to my Grampy's jeans for almost 15 years wanting to "something" with them. This would make a wonderful Christmas gift for her! I am a beginning quilter and would love to try this pattern! I have been saving jeans for a while just knowing the right project would catch my eye and this is it. My email is craftynat@prodigy.net. Thanks you for sharing, your quilts inspire me! I have been looking at this page for three days now. Yesterday I started cutting my denim jeans to pieces. I have only ever made one quilt before and that won't win any prices for sure, but I loved making it. I would love to have a copy of your pattern -- I love your denim quilts!! I absolutely adore up-cycling, and making something beautiful out of throw-a-ways!! Thanks so much! Sew Many Ways (dot blogspot dot com) has a linky party on Sundays and I Quilt for Fun (dot blogspot dot com) linked to a quilt she made using your pattern. I think you might be getting a new rush of fans! I would love to have the pattern for the denim quilts, and any advice and tips you can share. I'm excited to get started on one. My email address is kkmead1@aol.com. Thank you in advance. Good Evening Alicia, Wow these Denim Quilts are popular, I had to keep scrolling down to be able to leave a comment. I understand why they are popular, because we all have jeans which we can cut up and the different colour blues are lovely. I popped over from Jan, I Quilt for Fun to say hello as she recommended your site. I am certainly going to make a denim quilt for my husband as he will love it. I am now going to get up to date with your blog. I have enjoyed my visit and I have become a new follower. I would like to invite you to visit me at Ivy, Phyllis and Me! as you will be most welcome. What an absolutely FABULOUS idea that you have expanded on! I never, ever would have guessed that it was a Log Cabin type of construction, but, oh my goodness, that would make all the difference in the world. LOVE the idea of narrow sashing so that you're not struggling with the many layers of denim. If you are still sharing your version of the pattern, I would sure appreciate having it. My email is pirate AT value DOT net. Love this pattern too. Would like a copy of the pattern too. hbeebe2 at cox dot net. Hope all went well at your Relay for life. I absolutely love this jean quilt. Could you please send the pattern to me. Your denim quilts are very unique looking and pretty. I would love to have your pattern too if possible.. My email is vrscott921@gmail.com. Thank you so much!! May I also have a copy of the pattern? I have volunteered to make quilts for an amazing charitable organization that makes kits for all the battered women's shelters in Utah. I would love the pattern for this quilt to make for this project. Please email the pattern to lizfrancom@gmail.com. THANK YOU!! Here is a link to a video that explains the organization if you are interested https://www.youtube.com/watch?feature=player_embedded&v=VTFP-Lu8830#! mi sono innamorata di questi quilts!!! mi piacerebbe avere il modello!! Could i get this lovely denim pattern? Love the denim quilts and would appreciate the stained glass pattern. My e-mail address is jathiessen@yahoo.com. I also have fallen in LOVE with this quilt and now am in dire need of obtaining the pattern. My email address is KaraKrantz1991@gmail.com. Wow. I see thatpinterest has made this very popular!!! If you have a moment I'd love the pattern as well court.k.mattoon@gmail.com. I have made a few denim quilts but they all look the same. I'd love to try this unique look! I too love the varing colors and shades denim allows. Thank you for taking the time to share your talents!! Could you please email me the pattern? My email address is stasia.renfrow@gmail.com. Thank you in advance for your help. I would love to have this pattern . I would love to make this for my son in the army. Could you send me the pattern please. Having made 30" floor pillows of denim patchwork for our children's library room for several years, I've loved seeing your quilt - I have adapted the pattern from KF's book, and am just sending my appreciation for the inspiration! This is a beautiful and versatile pattern! Will you please share it with me? I've been collecting denim for several years but hadn't come across a design that really excited me. I believe this fills the bill. Thanks much! Hi Alicia, I have been collecting jeans for a few years now and I have a huge Rubbermaid container full! Your pattern is awesome and I hope you are still willing to share your pattern. I tried your e-mail link but I'm having trouble and it sends me an error message so I thought I'd try leaving a comment here. Thank you! Thank you for sharing your beautiful denim. I would love it if you could send me the pattern. thank you very much in advance! Could I please get a copy of the pattern. This is a beautiful quilt that I am excited to try! Thanks! Please post the pattern for the denim bedspread here as a link. I do not post my email publicly. Clearly there is still a lot of interest in your idea! Thanks! I don't have a link to the pattern but if you click on "View my complete profile" there is an option to email me and I will send it to you. I love this quilt and would love to have the pattern. Could you email it to me at tcbeckerman@gmail.com. Thank you SO much!! 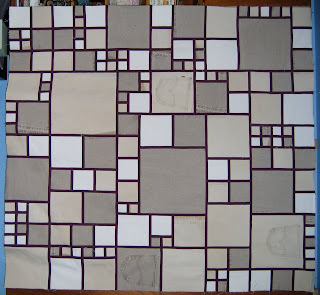 I came across your blog via Katie's Quilting Corner, and I would love to receive this pattern! I've been going to make a denim rag quilt, but I like this better. Thank you so much! Andrea, I would love to send you the pattern but I need your email address. You can email me from my blogger profile page. I just found your blog and I LOVE your variations of this pattern. They are all amazing. Could you please send a copy of the pattern to: pmcgurk@live.com ? Thank you!